I regarded Malta as the most unnecessary country of my expedition. The island is very remote from the other peaks. The flight tickets were insanely expensive and there is actually no mountain on the island. After coming to Malta my mindset turned completely around though. 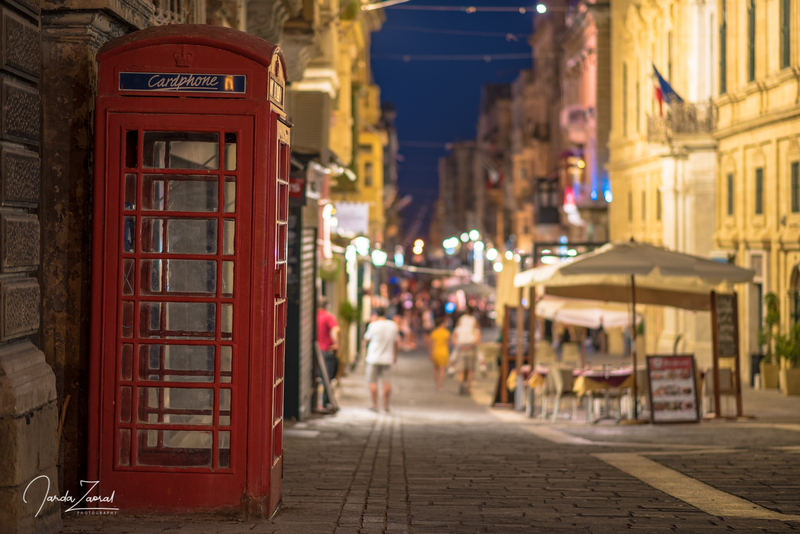 Malta was an amazing stop on my trip. I experienced there the most beautiful city of my expedition Valletta and even the highest point Ta’ Dmejrek of the island at Dingli Cliffs prepared for me beautiful views. After sleeping on the highest mountain in Cyprus in a car I wanted to find some more comfortable accommodation and I got lucky. I managed to book amazing accommodation at Lucente Guest Hhouse which I got for free in return for drone pictures and videos. The barter trade still works these days. The host Charlie was probably the most funny and friendly guy I met on my trip. We had a lot of fun. In addition he showed me the nicest spots around Valletta so I could take some amazing pictures. It was also the nicest accommodation I stayed at. Charlie showed that he is passionate about his business. Every room of his Guest House was devoted to one part of the Malta history. I got a room which was associated to the knight time. Really cool decoration. 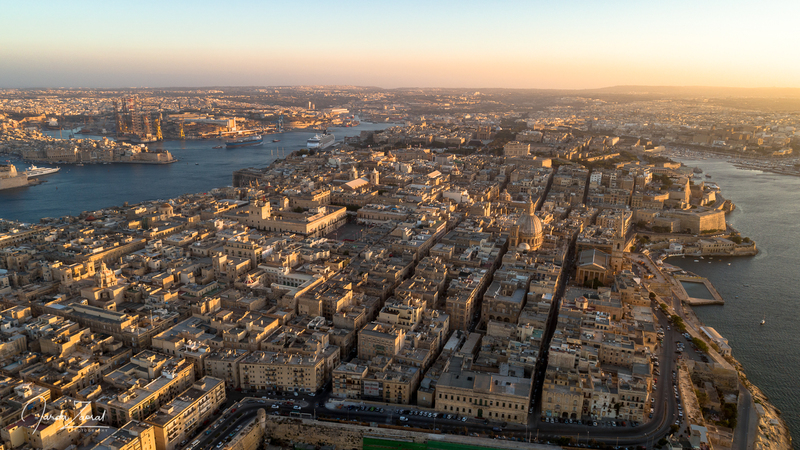 I spent the first day flying my drone around Valletta and it was great! 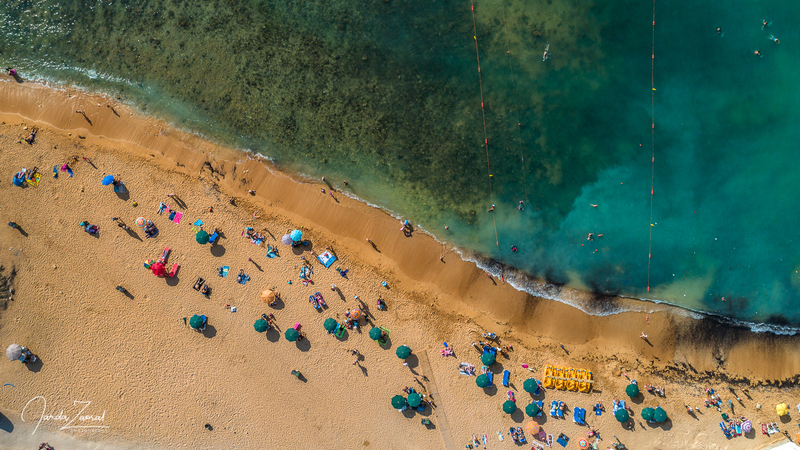 I didn’t have to care much about rules because Malta is the most drone friendly country with only a few restrictions. The next day I woke up pretty early so I would have enough time to conquer the highest point of Malta. 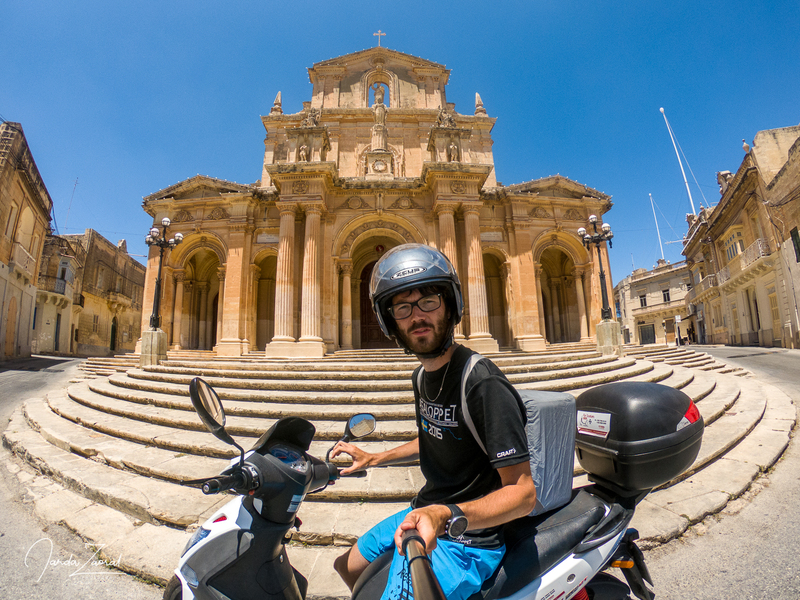 Since the highest point of Malta is closest to the sea from all European highest points, I decided to visit it by scooter. It was not easy to find a scooter rental, but I found one shop online and I got the scooter delivered to my Guest House. Malta is not a large island. Despite the mountain’s position on the other side of the island, Google Maps said I would reach it on my scooter in 30 minutes. The highest point of Malta Ta’ Dmejrek is situated at Dingli Cliffs which has one certain advantage. You have a beautiful view over the Mediterranean Sea. The trip seemed to be pretty straightforward but I encountered an unexpected problem. It was very windy so I drove my scooter slowly not to end up below the cliffs. Another problem showed up when I reached Ta’ Dmejrek. Since it was very hot I drove only in a T-Shirt and since it was windy I didn’t feel anything wrong. However, after stopping my scooter I realized: I am completely sunburnt. Again? I am curious when my plan not to get sunburnt over the following summer will work. Since it was 12 o’clock there was no natural shadow spot at all in 10km radius, so I found a shelter under the only umbrella in a local fast food shop close to the highest point. I drank 1,5 liter of water in a while and I felt much better. Then I visited the local chapel and took the 200m walk to the highest point. Yeah, I made it! After this dramatic summit I felt like celebrating my victory on a beach so I googled and I found the nicest beach nearby. Not surprisingly. Malta is really a small island. After the swim I visited one more city called Mdina with a great fortress recommended by Charlie and I saw basically the whole island. I left the scooter and was ready to leave to the airport but when saying bye to Charlie he told me: “Did you taste the Maltese style rabbit? If you didn’t, it is like you haven’t been to Malta!” I didn’t have time to taste the rabbit but Charlie insisted and promised me to take me to the airport, so I ordered one rabbit at a local restaurant. It took them so much time to prepare and I got really nervous. When the rabbit got served, I ate it so quickly that I didn’t even have time to taste it and I still don’t know if I liked it or not. However, Charlie dropped me at the bag drop at the airport 3 minutes before closing time so I caught my flight. At least after eating the famous rabbit I can say I have been to Malta. Take a scooter and visit the highest point of Malta at Dingli Cliffs by scooter but be careful in case of strong winds. The scooter will enable you to visit the whole island within a day. Don’t forget sun cream like I did. 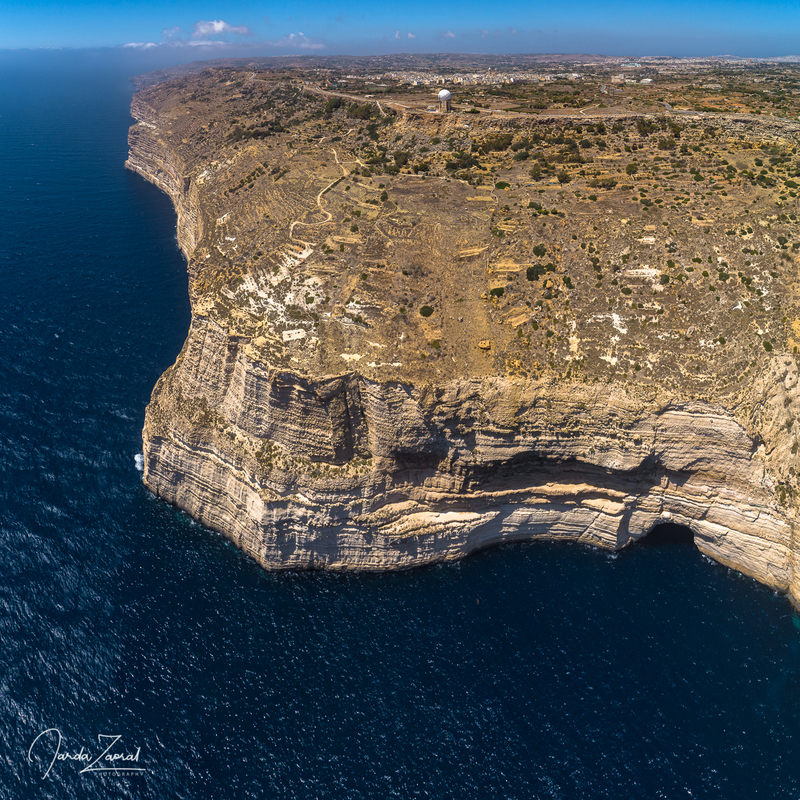 If you have time visit also the island of Malta called Gozo known for its amazing nature. I didn’t have time to visit it but it is a definitely good reason to come back.